In about nine months, IFRS 9 will replace IAS 39 and the new accounting environment won’t be the only element to be impacted. In recent months, the Basel Committee on Banking Supervision (BCBS), the EU Commission and the European Banking Authority (EBA) have also been tackling the impact of the new IFRS 9 provisioning on regulatory capital. After a consultation period running until 13 January 2017, the BCBS analysed all the comments received from different stakeholders on these new standards and has given jurisdictions the opportunity to observe an interim period to smooth the negative effect of the new provisioning on regulatory capital, the features of which are described below. 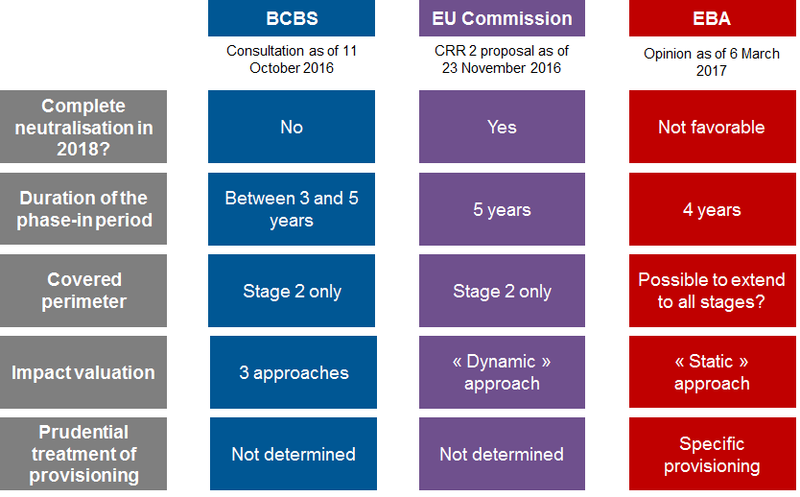 The BCBS first launched a consultation on 11 October 2016, which recommended the observation of a phase-in period to amortise the negative impact of the new accounting provisioning on regulatory capital, as well as the potential change in regulatory treatment. The EU Commission’s recommendations included a dedicated article in its legislative Capital Requirement Directive (CRD) V / Capital Requirement Regulation (CRR) II proposal as of November 2016. Finally, the EBA announced its opinion on 6 March 2017. What influence has the BCBS had on the new standards? Contrary to the consultation in October 2016, the standards do not facilitate the evolution of the regulatory environment. This approach is justified by the fact that there is no harmonised definition to distinguish specific and general provisions among jurisdictions. There is, therefore, a need for further and deeper analysis of the interaction between the new accounting framework and the current prudential one. In addition, the standards give the opportunity to jurisdictions to observe a transitional period to avoid any big “shocks” on Common Equity Tier 1 (CET1) capital. If banks decide to observe this transitional period, they will have to disclose data through Pillar 3 (comparison between phase-in and fully loaded treatment). It is important to note that, contrary to the EU Commission in its CRR II proposal, the BCBS takes into account the potential excess or shortfall of prudential Expected Losses (EL) into the regulatory framework, as well as the inclusion of Incurred But Not Reported (IBNR) losses in Stage 1 and 2 provisions before the introduction of IFRS 9. The standards allow jurisdictions to adopt a discretionary approach with a certain level of flexibility. As the CECL (Current Expected Credit Losses) will impact US Generally Accepted Accounting Principles (GAAP) from 2020 at the earliest, this transitional period is a means by which to alleviate the negative impact on EU regulatory ratios during the following two to three years of “distortion”.